The UTSA College of Business is selling our inaugural 50th anniversary Fiesta medal. The medals are $5 each. The medal was designed by Monica Garcia, a senior human resource major in the College of Business. Her design was selected as the winner by faculty and staff from an array of designs submitted by business students. The medal depicts the iconic facade of the Business Building and features a backstamp of UTSA’s 50th anniversary logo. 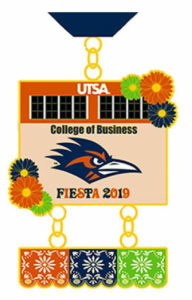 Quantities are limited, so order your UTSA College of Business Fiesta medal today. Medals can be purchased in person by cash or check at the College of Business Dean’s Office on the UTSA Main Campus in the Business Building Room 4.01.02. Or, they can be ordered online using a credit card. For more information or questions, call (210) 458-4313.